I’ve been meaning post this picture for a while. There is a Buddhist Temple a block away from my apartment. They always put on the most amazing visual displays for their celebrations. 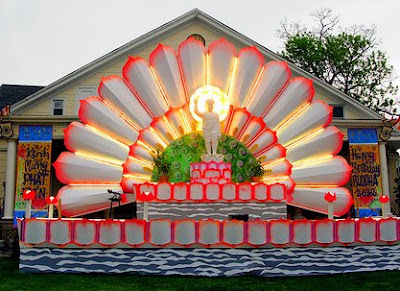 This was up in their front yard during the month of May to celebrate Buddha’s birthday. Complete with neon lights. I passed by this every day for a month on the way to my studio (which is only a 6 block commute). How lucky am I? Everyday inspiration for an urban potter can be a little different from that of a country potter. I think this is a nice illustration of one of ways it can differ. Not as many trees, but more neon lit Buddha statues. I love that buddha! I wish I could have it in my front yard. Wow that is amazing! I wish I had a Buddhist temple up the street. Here in rural NC we have churches every 300 ft.
We have 3 Buddhist temples (…that I know of…) within walking distance of apartment. Thanks for sharing it with us. It is indeed an inspiration! Thanks for posting this! It’s great to get a taste of holiday lights in the Spring!